The Apostles of Light were an order of Heretics in the Shivering Isles. They were led by Ciirta, a woman who had witnessed Sheogorath's disappearance during the Greymarch. Because of her belief that Sheogorath had abandoned his people to die, she founded a separatist faction of those who have lost their loyalty to Sheogorath. They call themselves the "seekers of light", and, as a symbol of this, they use Illusion magic to emit light from their robes. Luminary Kaz was second-in-command of the order. The Apostles were based in the Howling Halls, where they planned to one day storm Sheogorath's palace and overthrow the Prince. 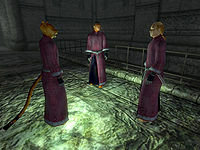 In 3E 433, Sheogorath's Champion infiltrated the group in an attempt to get Ciirta's eye, needed for the reconstruction of the Staff of Sheogorath. Ra'kheran‎ confronted the Champion, seeing past the disguise, and requested the Champion to retrieve several ritualistic daggers for him and a group of rebels in the order, as Ciirta had banned them from possessing weaponry. Once armed, Ra'kheran led an attack on Ciirta and the Champion took her eye. Following the death of their leader, Ra'kheran attempted to take control, to the dismay of the surviving loyal Apostles. The group later seemed to have disbanded and became indistinguishable from the common heretic found throughout Mania. For game-specific information, see the Shivering Isles article and the related quest article. This page was last modified on 1 August 2018, at 20:26.